Anyone who has been working with Tarot for a little while will understand the essential role of energy in a Tarot reading. In order to make the cards meaningful you need to tap into your own intuitive energy, the energy of the person for whom you are doing the reading, the energy of the situation that you are trying to understand, and the more general energy that exists between everything in the universe. It is by tapping into this energy that we can gain a clear understanding of what is happening in the here and now. Crystals absorb, store and transmit energy, and as such, are an excellent tool to enhance a Tarot reading. There are a variety of different ways you can use crystals in Tarot. As mentioned by Numerology Sign, as you use your Tarot Deck to pull on various energies to make your reading, some of these energies can stick to your deck, making it difficult to use. When your cards pick up excessive energy, or energy that isn’t right for them, you may find yourself not knowing when to stop shuffling, or feeling like your readings are muddled or unclear. There are two main ways you can use crystals to cleanse your deck. The first is to give your cards a moon bath under a crystal such as a clear quartz. You simply leave your cards somewhere that they will be bathed in moonlight for most of the night underneath your selected crystal. The second way is simply to leave your cards sandwiched between two crystals for a day or so to let the crystals absorb the energy from the deck. Spirit Quartz is another great crystal for this kind of cleansing. Sometimes after a particularly tense or negative reading with a client, you can feel their energy hanging around you and leaving you feeling just a bit off. You can use crystals to cut the cords that may have formed between you and the client during the reading and refresh yourself. Black Tourmaline is an excellent crystal for this kind of ritual. All you need to do is hold the crystal in your dominant hand and make small cutting motions in front of your body while holding the thought of the particular person you are trying to break with in your mind. 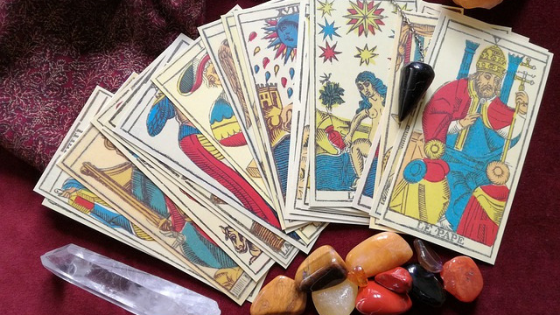 Since few of us have the luxury of a dedicated space for Tarot reading, we are often forced to do our readings in spaces with a lot of other uses, and therefore connotations and energies. Crystals can be used to adapt the energy of our space for its new purpose, reading the Tarot. Different crystals vibrate with different energies, and any crystals can be used to call different energies into a space. You should select your crystals based on which energies you are seeking. You’ll find a list of crystals most useful for Tarot further down in the article. When preparing your space for a reading, simple place the crystals around the boundaries of the space that you will be using. This will call energy into your space, and in some cases blocking other energies from entering. Including a crystal in your Tarot reading can help focus the energy drawn into the reading on the intention that you have in mind. For example, Rose Quartz is associated with love, so if you are doing a love associated reading, including the Rose Quartz in the reading will help ensure that the energy being drawn in by the cards is focused on this intention. This should make your reading more focussed and potent. While there are many different ways that you can incorporate crystals into your reading, the simplest is just to hold the crystal in your hand during your reading, or place it on the table where you will be using the cards. Before using your crystals in any of the ways listed above, you should prepare them by cleansing them, and then imbuing them with the desired energy. As Crystals retain energy, it is important to always cleanse them before you use them. This is simple to do. You can simply leave your crystals somewhere where they will be bathed by sunlight or moonlight for a day or night to reset their energy, or you can smudge them. Smudging is the practice of passing the crystal to be cleansed through the smoke of an incense stick to renew its energy. Sage is always a good choice for cleansing. Remember that before cleansing any of your tools, it is always a good idea to cleanse yourself, so that you don’t pass any energy that you have inadvertently picked up back to your tools. As well as cleansing your crystals, in some circumstances, such as transforming the energy of your space or focussing the energy of a reading, you will also want to imbue your crystals with the selected energy. This can be a simple practice, just holding the cleansed crystal in your hands while meditating on the particular energy that you would like the crystal to carry. You can also use the same moon bath that is recommended for cleansing to imbue a crystal with particular energy. As the moon changes phases, it also moves through the signs of the zodiac, and the different constellations have different energies. For example, Capricorn is linked with business and career, so if you bath your crystal in moonlight while the Full Moon is in Capricorn, you can also charge it with energy to enhance your business related readings. While any crystal may be useful for enhancing a reading, depending on what you want to achieve, these six crystals are probably the most useful. Clear Quartz can be used for almost anything as it has a strong clear energy. It can be used to cleanse a deck, amplify and focus the energy of a reading, and clear the energy in your reading space. Rose Quartz is linked with love, but also the heart and emotions, and so is useful for many readings. If you are doing a reading for someone who is struggling to open up, having this crystal in your space can help them share their emotions with you. Celestine has a high spiritual vibration, and its presence can help you connect with the spiritual realm. When used in a reading it should help heighten your intuitive ability, and when placed in your space should bring a calming energy. Like Celestine, Amethyst has a high spiritual vibration and is especially useful for reducing fear, anxiety and anger. It can be useful in helping visualise things that don’t seem firm, and will often draw attention to the higher purpose of things in a reading. Spirit Quartz is also useful when you have a client who feels blocked to help them open up so that together you can get to the root of their challenge. Using this crystal during a reading can also help clarify the bigger picture. Black Tourmaline is very grounding and can help protect against negative energy, which is why it is ideal for the cord cutting ritual described above. Keeping the stone in your reading space can also help create a safe space for the reading itself. Guest Post article by James H.